We have decades of extensive experience in providing the skilled care necessary to preserve thousands of hand knotted rugs and hand woven kilims, including treasured family heirlooms, collectible museum-quality antique rugs, and pieces appreciated for their decorative value in clients' homes. Below, we have a before and after gallery of just a few of our rug and kilim repair and restoration projects. We believe that combining these steps to restore a handmade rug or kilim is an art form in which we take great pride. We are committed to providing our clients with the knowledge they need to make informed decisions about how to care for and preserve their rugs and kilims for years to come. As such, we provide free inspections of all clients' rugs and kilims in need of repair or restoration. During these inspections, we provide detailed explanations of the various repair and restoration options available to our clients. In addition, we provide clear and detailed information regarding the price of all repair and restoration options available to our clients. Please call us at 1 212 300 3348 or email us at info@traditionalrugrepair.com or to learn about scheduling a free inspection of any rugs or kilims you believe may need repair or restoration. The fringes on my rug are coming undone. Is there something I can do? Absolutely, fringes can be repaired and bound. It is important to have any fringe damage addressed as soon as possible. The more a rug's fringes unravel, the more difficult and costly the repair will be, especially if the pile, which the fringes protect, is damaged. Is there a difference between rug repair and rug restoration? People often refer to rug repair and restoration interchangeably. Technically, a restoration, however, implies that the work is meant to restore a piece to its original state. A repair is meant to fix a problem, which may or may not mean that it will be restored to its original state. As such, in some instances, a restoration can be the same thing as a repair. However, in some instances, to properly restore a rug will require more than just repairing a specific problem such as fringe unraveling. When we examine your piece, we will tell you the options available to you, repair or restoration, and give you estimates for both. How much does restoration or repair of a hole cost? Because each handmade rug and kilim is one-of-a-kind and because each problem will be unique, it is impossible to state how much it will cost to address all problem areas. This will depend on the individual circumstances. However, we give free estimates to all of our clients at no obligation upon our inspection of their rugs and kilims. My rug was eaten by moths. Can it be fixed? Yes, a rug eaten by moths can be repaired. Before we repair it, however, we will have to professionally clean it to remove any moth larvae still living in the rug. Do you only repair and clean Persian rugs or Oriental rugs? No, we provide all kinds of services on handmade rugs and kilims, including cleaning and repairing Navajo rugs; dhurrie kilims; and handhooked rugs. This exquisite antique Caucasian Kazak rug was worn in several areas and had a section along its border entirely mising. We reknotted the missing fragment and the worn border section. 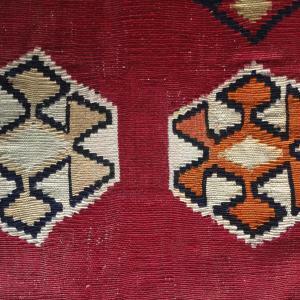 The restoration of this Gocmen kilim involved rebuilding parts of the missing and damaged cotton warp and reweaving the missing weft using the traditional slit-weave technique. For more information about this restoration, please visit our blog where we tracked our progress from start to finish. The restoration of this antique Turkish Oushak rug included reknotting the golden edges of the flower, the central beige area of the flower, as well as the gray areas surrounding the golden flower. In addition, the pink and golden worn areas were reknotted. For more information on this restoration, please visit our blog where we discuss this project in more detail. This restoration of this antique Caucasian kilim involved rebuilding the missing warp of the damaged and worn kilim and reweaving the weft. Restored areas include the blue, ivory, and pink medallion as well as the surrounding brown areas. A significant challenge of restoring antique kilims is finding yarns to use in the restoration that can blend into the existing yarns of the antique kilim. This exquisite antique Persian rug had been torn in half. In addition, a signficant part of its pile had been so worn that the warp and weft were exposed thereby compromising the structural integrity of the piece. We rejoined the Persian rug's two pieces and reknotted all the worn areas. We bound the selvages and fringes, completing our extensive restoration. This exquisite antique Persian Serapi rug needed extensive restoration. Pictured above in the first illustration is but one of the sections that needed extensive restoration, including to address a tear in the pile, damage to its selvage, as well as significantly worn pile. Please visit our blog here for more details about our restoration of this exceptional antique Persian rug. 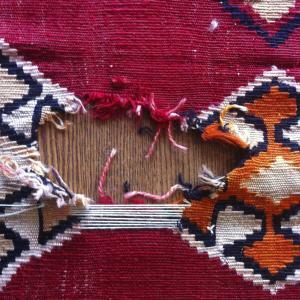 This Turkish rug was damaged when a heavy piece of furniture that had rested on the rug for years was repeatedly dragged on the rug eventually causing a small hole on the rug's border. 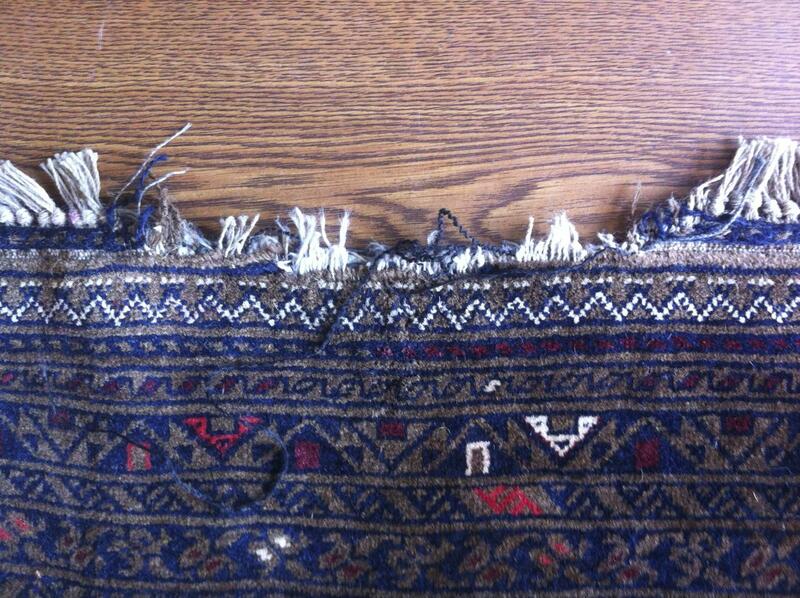 To repair the Turkish rug, we rebuilt the warp and reknotted the missing and damaged pile. For more information, pictures, and explanations of the development of this rug repair, please visit our blog. This Moroccan kilim's selvage (selvedge) almost completely came undone and allowed the kilim to fray at its edges. 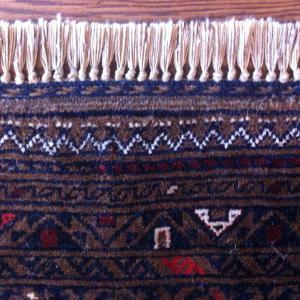 To restore this Moroccan kilim, we rewove the damaged weft, repaired, and bound the selvage. 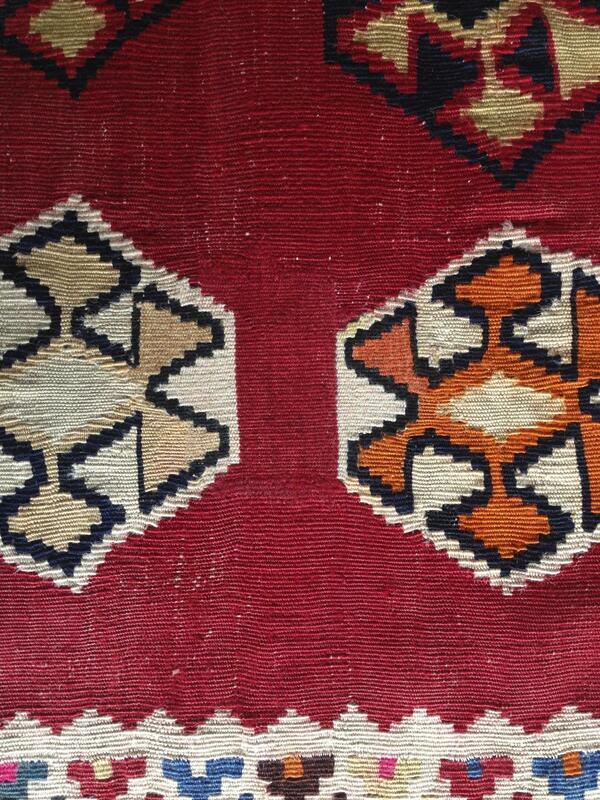 For more details about this kilim restoration, please visit our related blog entries here. A section of this Turkish rug was completely missing. The rug repair included recreating the warp and reknotting the pile following the floral motif of the central medallion's pattern. 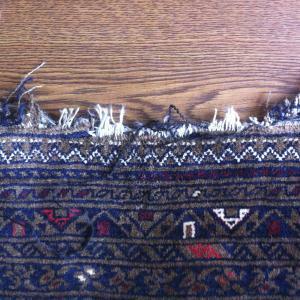 Please visit our blog for more information on this rug repair. This fine semi-antique wool and cotton Persian rug was missing a section of pile at its border as well as part of its fringes. We recreated new warp in the affected section thereby recreating the missing fringes. We used cotton fibers to be consistent with the original fringes. Subsequently, we reknotted the missing pile taking care to choose yarns to match the original knotting. Lastly, we bound the fringes so as to minimize the risk of any future unraveling. This vintage Turkish rug had a corner section missing, with surrounding fibers compromised. We extracted all damaged yarns, reconstructed the missing warp, and reknotted the missing corner section. We reknotted the pile and replicated the missing motifs, including the running water border motif. A client's puppies snacked on this Oriental rug's fringes and caused extensive damage. We recreated the warp and new fringes. We finished the repair by tying decorate knots where the fringes met the pile. Please see our blog for more information. 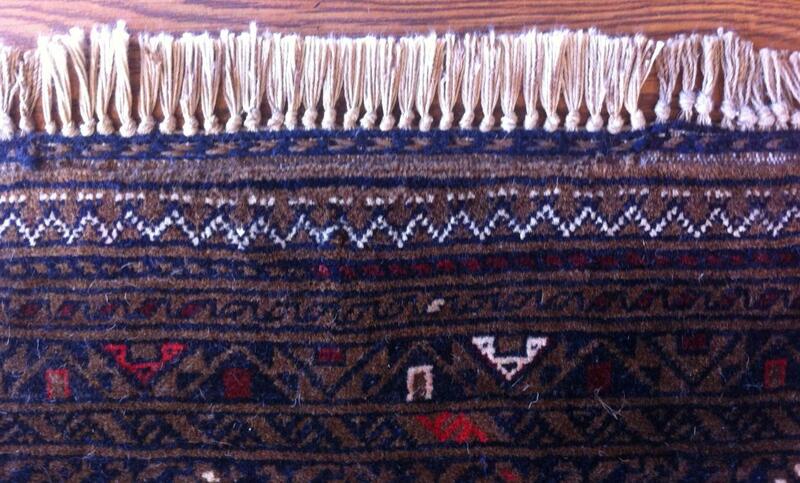 This Moroccan kilim's edges were compromised by a damaged selvage and the weft was beginning to unravel. The kilim restoration included reinforcing the weft and binding the edges in accordance with the striped and different colored motifs. Please visit our blog for more details about this Moroccan kilim restoration. This Persian rug fell victim to a common threat to quite a few fine rugs - the rambunctious pet. The unraveling edges threatened to compromise the rug's border if neglected. Repair involved reweaving the missing edge (and matching the gradations of color) and reinforcing it to minimize the risk of future unraveling. This gorgeous handhooked rug had quite a few worn areas that needed repair. The solid colored motifs against the rich black background really allowed the beautiful abrash (natural variations in the color of the yarns) to shine through. We tried to keep the repair consistent with the original by using yarns that also had similar variations in their color. This chain stitched wall tapestry was torn in several areas, including in the area pictured above. The repair conformed to the neutral warm palette of the original. We also reinforced areas that were not visibly damaged, but structurally compromised. This Persian kilim had several holes, tears, and compromised areas. The area highlighted above is just one hole of several. We recreated the warp and rewove the missing weft. As always, the goal was to blend the restoration with the original as much as possible. Vist our blog for more details about this project. 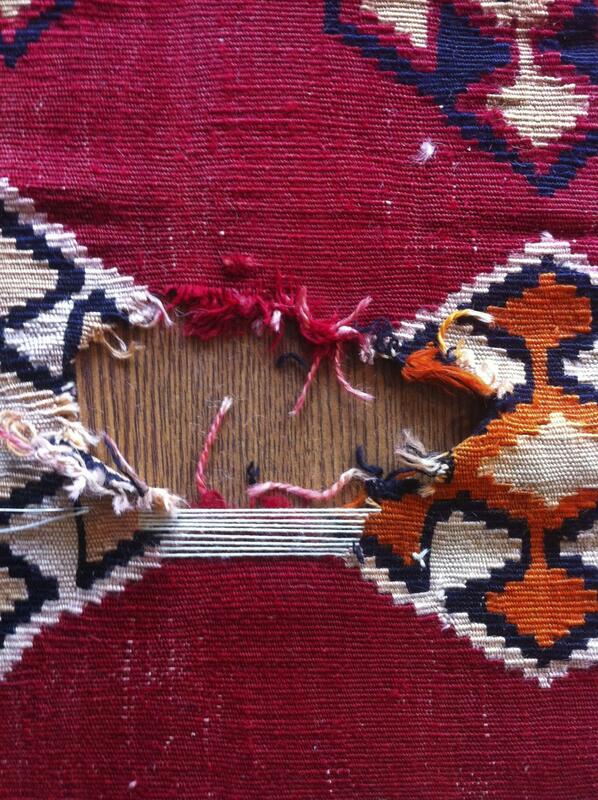 This Turkish kilim was damaged by a client's dogs who chewed the entire edge and most of the fringe off the kilim. The client opted not to restore the kilim at this time, but rather to repair the edge and bind the fringe to prevent further unraveling and allow the client to use the kilim. This Indian rug was damaged by a flood in the client's home. We had to first dry the rug, professionally clean it, and then dry it again before commencing any repair. The repair entailed rebuilding the warp and weft and reknotting the pile along the selvage of the rug. Please visit our blog for more information about how we repaired this rug damaged by flood waters. Repairing this Caucasian kilim required building the missing warp, and reweaving the missing motifs. Please visit our blog entries to see a detailed step by step illustration of how this repair was done. Please also visit our blog in which we document our latest repair and restoration projects and share advice with clients and interested communities about how they can care and preserve their hand knotted rugs and hand woven kilims.